SEBASTIAN Vettel send out a reminder to everyone today; ‘try and stop me if you can!’ The world champion dominanted the Bahrain Grand Prix to claim his first win of the 2012 season after a trying start. Having started from pole position, Vettel battled high fuel consumption and constant tyre management throughout to lead almost from the start. Cooler track temperatures helped in Red Bull’s return to the front of the field and Vettel is now reunited with the top of the drivers championship leaderboard. The Lotus pair of Kimi Raikkonen and Romain Grosjean completed the rostrum. It was the first time a Lotus driver has stood on the podium since Nelson Piquet finished third in the 1988 Australian Grand Prix. It was a nightmare day for the British duo at McLaren as pitstop blunders, poor pace and reliability issues left the team leaving tonight with just four points to show for their hard efforts this weekend. As in many situations last year, Vettel led into the first corner and pulled out a massive early advantage to clear him of any attack from the DRS zone. He stormed into a seven second lead as from early on, the McLaren attack, led by Lewis Hamilton was already looking blunt. Grosjean had made an unbelievable start to move upto fourth from seventh on the grid. The Frenchman quickly found a way past Mark Webber and then easily used the DRS to drive clean past Hamilton on the seventh lap and into second place. Button was complaining of poor traction and he was overwhelmed by a feisty Raikkonen, before pitting to ditch the option tyres after only eight laps. Vettel briefly handed the lead to two stopping Paul di Resta when he pitted, but quickly overtook the Scot on lap 13 to reassume control. On the same lap, Raikkonen powered past Webber into turn 11 and started closing in on Grosjean, who was falling back into his team-mate’s grasp. Raikkonen got past on lap 22 with consummate ease and through the second stops, was on a mission. Vettel’s six second gap evaporated and by lap 35, the pair were together with the Lotus looking fundamentally faster. Meanwhile, another horrific pitstop for Hamilton pushed him behind Massa and out of the points positions by half-distance. Pastor Maldonado retired when the Williams suffered a tyre failure and spun exiting turn three. He crawled back to the pits and retirement with shattered rear suspension. Raikkonen had one brief opportunity to pass Vettel, but was blocked resolutely by the champion. Both came in together on lap 40 and a quicker Red Bull pitstop enabled the German to build up a three second lead. Aware of the tyre issues that saw his alarming fallback through the field in China last Sunday, Raikkonen and Lotus applied a more cautious approach to the chequered flag and bag the useful points on offer. Whilst Hamilton spent a frustrating afternoon chasing the Ferrari’s, Button had a lonely race circulating between fifth and seventh places. He was catching di Resta when he made a sudden pitstop with four laps to go. The 2009 winner in Bahrain had detected a left-rear puncture. He slid out of contention into 13th and a broken exhuast a lap later saw him retire in the garage. Bruno Senna retired late on too with mechanical gremlins to compound a miserable day for Williams with a double retirement. Vettel was able to cruise across the line to take the victory, although he was instructed by his race engineer Rocky to stop on the pitlane exit, presuminably with minimal fuel levels. It meant we were denied the ‘that’s what’s I’m talking about,’ message on the team radio. Raikkonen was a fantastic and committed second and considering he started 11th, this underlined severe underperformance in qualifying. Grosjean’s third place is the first podium for a French driver in F1 since Jean Alesi at Spa in 1998. The way he is driving at the moment, it won’t be the last in 2012. Webber cemented his consistent approach to record fourth for the fourth successive start. After a terrible first lap that saw him slip to ninth, Rosberg battled back aggressively to fifth. Paul di Resta held off Alonso and Hamilton in the closing laps to match his best ever result in F1 with sixth. Massa achieved his first points of the season, despite breaking down on the slowing down lap back to the pits and Button’s late demise enabled Schumacher into the points. Sergio Perez missed out in 11th, whilst Daniel Ricciardo’s chances of a great result were ruined by a shambolic start, then contact with Heikki Kovalainen on the first lap that left the Australian with a damaged front wing. The four flyaway races are complete and only ten points cover the top five in the drivers championship. Six different teams have already stood on the podium and we have four different winners in the first four races for the first time since 2003. 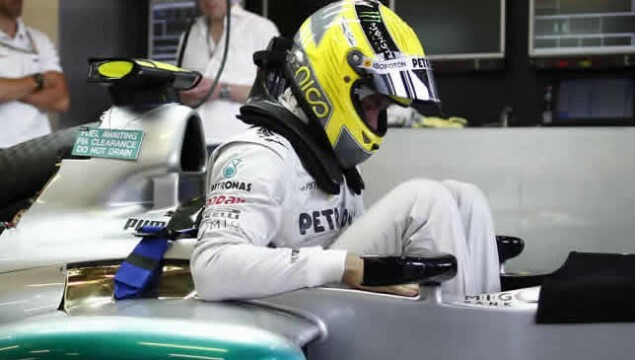 Formula One 2012 is proving to be a very unpredictable and challenging season to even guess, let alone predict. Luckily the racing did the talking today and Bernie Ecclestone and Jean Todt can breath a huge sigh of relief tonight that there was no significant trouble in the unstable area today. There is a test at the Italian circuit Mugello next week, before the start of the European season at the Circuit de Catalunya in Barcelona on May 13. It is advantage Red Bull and Vettel after Bahrain, but 2012 has plenty more twists and turns in store to come. SHANGHAI hosts the third round of the 2012 FIA Formula One World Championship. The Chinese event has now been a fixture on the Grand Prix calendar since 2004. Although it has struggled to maintain a decent attendance from the Chinese locals, the circuit is enjoyed by the drivers and with the various mix in weather conditions, the event has thrown up many special races. The inagural event in September 2004 was won by the Ferrari of Rubens Barrichello. It was a popular win for Rubens, on a weekend where Michael Schumacher had one of his worst weekends ever at Ferrari. Schumacher had a technical problem on Friday, spun off into the gravel in single lap qualifying and in the race, had a clash with Christian Klien, another spin and a puncture. Schumacher finished a lap down and back in 12th place. Jenson Button made a two stop strategy work to finish a close second for BAR Honda whilst Kimi Raikkonen completed the first ever podium at the Chinese Grand Prix. 2005 was the season finale and there was a close battle for supremacy between Renault and McLaren Mercedes for the constructors championship. Renault carried a two point advantage and thanks to more powerful engines, dominanted the weekend. 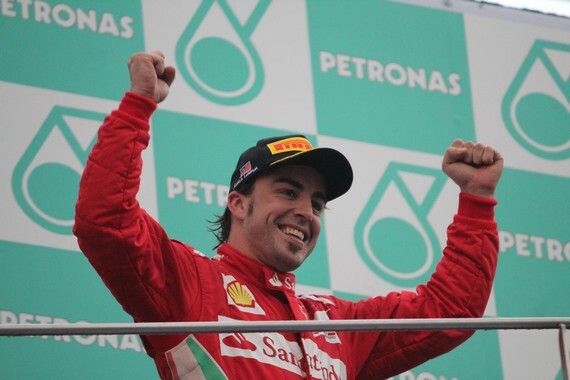 Fernando Alonso coasted to his seventh win of the season in which he became the man to knock Schumacher off his perch. McLaren’s cause to win the teams battle wasn’t helped, when Juan Pablo Montoya hit a loose drain gully, which wrecked his front suspension. Raikkonen’s second place wasn’t enough for the Woking team whilst a pitlane infringement by Giancarlo Fisichella in the sister Renault handed Ralf Schumacher a surprising podium for Toyota. Narain Karthikeyan spectacularly crashed out in the last event to witness a Jordan Grand Prix entry and Schumacher Snr had another mere in China. He unbelievably crashed into Christjian Albers on the way to the grid and then spun off behind the Safety Car. A year later, he conquered those demons. 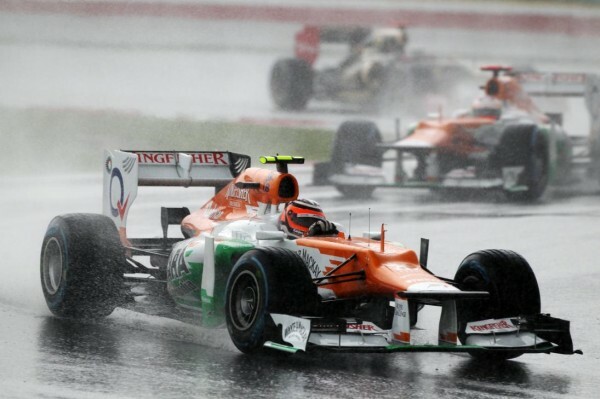 On a wet and windy weekend in 2006, the teams running Michelin tyres had a significant advantage. All of the Bridgestone shod users like Williams and Toyota struggled with the conditions. Schumacher wrestled his Ferrari around to sixth on the grid, then put an immense drive on Sunday. He was helped by a technical retirement for Raikkonen and some poor tyre strategy from Renault which meant early leader Alonso lost a comfortable 15 second lead. The team decided to use Fisichella in an attempt to win the race, but he couldn’t hold back Schumacher’s relentless charge. The German won his 91st race in Formula One and it was one of his most unlikest successes. The delight he showed in parc ferme afterwards summed up his delight. As we stand now, this is his last win and last podium in the sport. Tyres played a crucial role in 2007 too. Lewis Hamilton arrived with the possibility of winning the title in his stunning maiden season. He was 12 points clear of team-mate Alonso and 17 ahead of Raikkonen, now driving for Ferrari. He took a brilliant pole position and drove away effortlessly from the field in the opening laps. When the first pitstops arrived, McLaren elected to keep him on worn rubber. Raikkonen closed him down and passed him comfortably. Rather than back off and save his worn rubber, Hamilton attempted to keep pushing and the team were very reluctant to bring him in, hoping for another rain shower. It didn’t come and when he did pit, the tyres gave up their final bit of grip. Lewis agonisingly slid into the gravel trap and got beached. 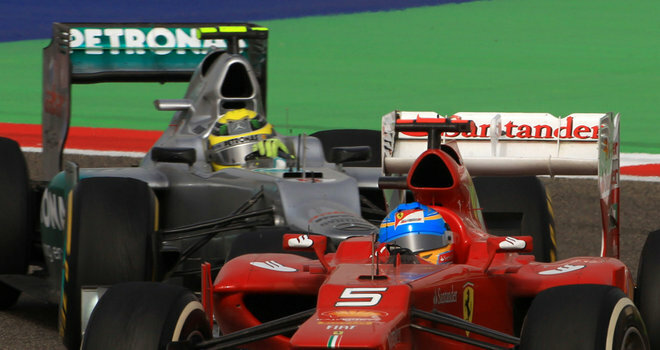 His race ended and with Raikkonen winning from Alonso, the championship shootout went all the way to Brazil. There was also a noticeable drive to fourth place in the unfancied Toro Rosso from a certain S. Vettel! After the nightmare of 2007, Hamilton arrived for the penultimate event of 2008 under pressure. This followed a diabolical drive at Fuji seven days earlier. He was receiving stinging criticism from his rivals, with Alonso and Robert Kubica very outspoken about his aggressive approach. Hamilton did his talking on the track and produced a disiplined drive to an easy victory. In a race that lacked excitement, Ferrari had to play the team orders game with Raikkonen to allow Felipe Massa two extra points for second place. Kubica’s outside championship hopes ended when he was knocked out in Q2 and struggled to sixth place for BMW Sauber. From 2009 onwards, the Chinese Grand Prix has moved from a season ending race to one of the early flyaways. Torrential rain in 2009 halted the Brawn GP march towards both championships. Jenson Button and Rubens Barrichello finished third and fourth, but couldn’t match the ultimate speed from Red Bull Racing. Despite a driveshaft issue in qualifying, Sebastian Vettel took pole position and controlled the race with supreme composure, on a day when many of his rivals were sliding off the road for fun. 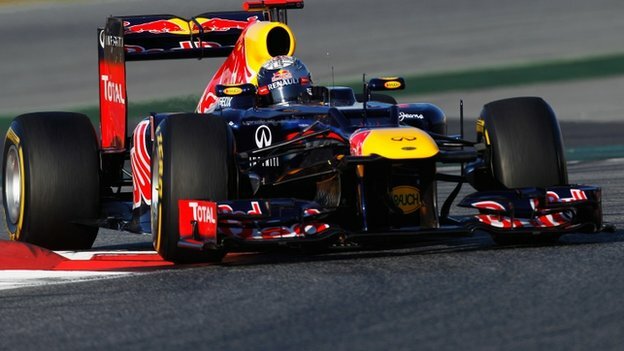 He took Red Bull’s first ever Grand Prix victory and Mark Webber followed him home in second place. It was the start of things to come for the Milton Keynes empire. Red Bull had a bad day in China 2010 though, trailing in a distant sixth and eigth thanks to some awful pitstops. Button got it right on the day in changeable conditions, to lead new team-mate Hamilton home for a McLaren 1-2. 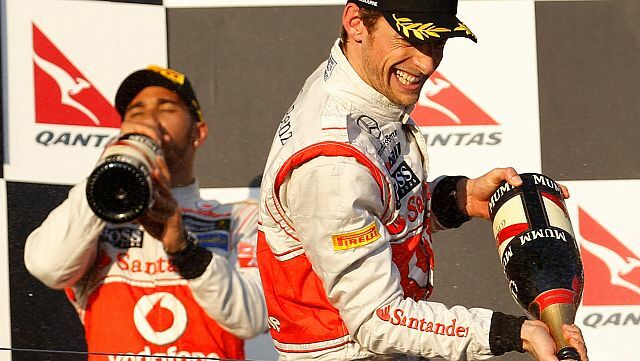 It was Button’s second win in four events for his new team and cemented his move from Brawn GP over the winter. Nico Rosberg produced a strong race to finish third and Alonso recovered from a blatant jump-start to record fourth for Ferrari. His fightback included a bold overtake in the pitlane entry on his team-mate Massa. Seven different winners in seven years, but the run ended last year. Hamilton produced a metoric display to pass Vettel with four laps to go and record a brilliant victory. This was despite an engine issue nearly prevented him the chance to start the race. The 2011 race has gone down as one of the all-time classics ever in history. A fuel consumption issue blew Rosberg’s chances of a shock victory and he wound up a frustrated fifth. Poor strategy decisions from Ferrari cost Massa a deserved podium and left him trailing in sixth, but nearly half a minute clear of Alonso. Button made a meal of his first pitstop, by stopping in the wrong pitbox! He finished fourth, overwhelmed in the dying stages by the incredible Mark Webber. The Aussie finished third having started a miserable 18th on the grid. 2011 provided passing galore thanks to DRS and the Pirelli tyres. Throw in the unpredictable weather elements and I’m sure we will be in for another Shanghai stunner at the weekend. FERRARI returned to the top of the podium against the odds in the Malaysian Grand Prix today. Fernando Alonso drove an awesome race in very changeable conditions to take an unlikely victory, taking advantage of superb pitwork and awful pitstops from McLaren that put them in the driving seat. The drive of the day though came from Sergio Perez. 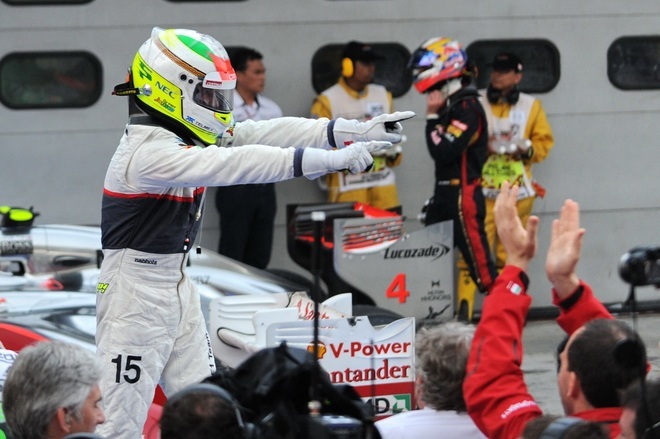 The Mexican drove a blinding race to finish second, achieving Sauber’s best ever result as an independent constructor. Alonso is now the surprising leader in the drivers standings, as Jenson Button, Sebastian Vettel and Mercedes GP had a day to forget. Cooler conditions and grey skies overhead threw all planned strategies out of the window as the build-up to the lights going out came closer. With rain in the air, all drivers started on intermediate tyres, apart from Pedro de la Rosa. The Spaniard would begin from the pitlane after an issue firing up his car on the dummy grid. When the lights went out, the two McLaren’s charged away from the rest of the field, with Lewis Hamilton protecting the inside line from Button to maintain track position, unlike last Sunday in Melbourne. Into turn three, Michael Schumacher was tagged by the fast-starting Romain Grosjean in the Lotus which saw both cars spin around. The unrepentant Frenchman blamed his rival, telling Reuters: “I was there, I was careful and unfortunately Schumacher hit me in turn four and I spun.” At the end of a very tricky first lap, Hamilton led Button, Mark Webber, Vettel, Alonso and Nico Rosberg. Meantime, Perez’s stunning day started with an inspired decision to pit for extreme wets at the end of the first lap. This moved him upto into third place by the time everyone else made the same switch. Grosjean became an early casualty again, when he spun off on the fourth lap entering turn six. Soon afterwards, a bolt of lightning hit the circuit and the Safety Car was dispatched as conditions worsened. Button saying over the team radio; “The last sector is like a lake.” On lap nine, Charlie Whiting sensibly got the track officials to throw the red flag, suspending the race pending a Safety Car restart. 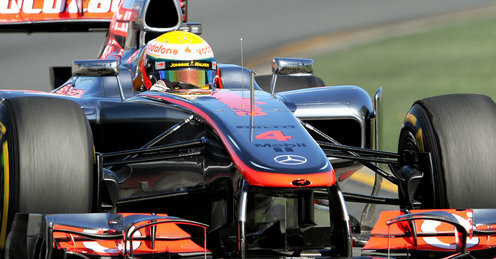 Following a 50 minute delay, the cars left the grid with Hamilton leading Button, Perez, Webber, Alonso and Vettel. Following four slow laps, conditions eased up on lap 13 for the green light to resume racing. Some drivers, including Rosberg and Kimi Raikkonen came straight in for intermediate tyres. On the restart, Alonso caught Webber napping into the first corner and vaulted into third position, as Button had also pitted after the restart for fresh rubber. Two laps later, Perez inherited the lead as Hamilton came in. However, a delay on the rear jack, combined with having to wait whilst Felipe Massa came into his box saw the McLaren costly lose track position to both Alonso and Button. Perez’s gamble of staying out an extra lap saw him have the lead on merit, but only briefly as better traction off turn two on lap 16 gave Alonso first position. Traditionally, Jenson Button thrives in these conditions but a lap earlier, he made a clumsy error of judgement and tagged the Hispania of Narain Karthikeyan in turn nine. No blame could be attached to the Indian driver, as they were battling for position at the time. Another horrible McLaren pitstop whilst his front wing was changed effectively took the Melbourne winner out of serious contention for points. For a while, Alonso threatened to runaway completely from the rest of the field, but as his intermediate tyres started to lose grip, Perez continued to hassle him with the gap dropping to less than a second. The Sauber was the fastest car on the circuit, proven by his string of fastest laps. Further back, a dry line began to appear and Daniel Ricciardo’s smart move onto slick tyres saw another mad dash for the right rubber, with little change to the significant positions. Once again Mercedes showed no race pace whatsoever, evidently showed when Rosberg lost three positions to Vettel, Raikkonen and Webber in two laps. He finished out of the points, whilst Schumacher benefited from a late engine failure on Pastor Maldonado’s luckless Williams to score a fortunate point. Today, Fernando Alonso reminded us just why he is a former double world champion whilst Sergio Perez deserves to share the headlines for his incredible drive. He gave us a glimpse of a promising future, possibly very soon as Alonso’s team-mate. The teams head home for a three week break, before resuming in China on April 13-15. LEWIS Hamilton set the standard in practice for Sunday’s Malaysian Grand Prix. The McLaren driver looked comfortable on the Sepang layout throughout the day and ending up topping the timesheets today in both sessions. In the morning session, he lapped a full half a second faster than world champion Sebastian Vettel in very humid conditions. A few hours later, Michael Schumacher was the Brit’s closest challenger, but still 0.4secs slower. Although thunderstorms are forecasted for the rest of the weekend, Hamilton will start tomorrow’s qualifying session as an overwhelming favourite for pole position. Mercedes GP were McLaren’s closest rivals today, with Schumacher and Nico Rosberg featuring prominently in the top four in both sessions. Vettel, who expressed that the balance was not perfect over the team radio in the second session wound up a slightly frustrated tenth. He is normally cool, but even the young German seemed to be feeling the heat of Kuala Lumpur after his struggles this afternoon. There was plenty of drivers who made use of the wide asphalt areas, although only Narain Karthikeyan stopped out on track today and that was after only eight laps in the first session thanks to a hydraulic glitch on the struggling HRT. The one driver who suffered the most was Paul di Resta, who went off the road twice. His first execursion was caused by a brake duct issue, which punctured one of his front tyres. The second mistake was down to driver error, although the Scot did keep the car out of the barriers. Ferrari have brought a new chassis to this event for Felipe Massa, although the Brazilian made no impact on the times. Team-mate Fernando Alonso experimented with a new front wing in second practice and finished a solid sixth, after finishing up behind Massa in session one. There was a new driver in the car today, as GP3 champion Valterri Bottas took over from Bruno Senna this morning for Williams. The youngster accredited himself well, outpacing Pastor Maldonado before handing back driving duties to Senna this afternoon. There was a blow for Kimi Raikkonen, when his gearbox which had been damaged by some off-roading in Australia overheated in the sweltering conditions. He will lose five grid positions for the race by getting a new gearbox. Raikkonen told Sky Sports F1; “It was a frustrating day. We struggled to get a good set-up and it felt quite slippery. Hopefully it will be better tomorrow.” Fellow Finn Heikki Kovalainen will get a five place drop too following a Safety Car infringement in Melbourne. Raikkonen also mentioned about high levels of tyre degradation and the boss of Pirelli, Paul Hembrey has admitted that three stops are likely for most drivers on raceday. So, Mercedes GP look like a contender for top grid positions, Red Bull have work to do and McLaren certainly seem to be the leading force again. Weather permitting, Hamilton has to be confident for his chances tomorrow. HERMANN Tilke’s first Formula One circuit was the challenging and demanding Sepang, home to the Malaysian Grand Prix. In the 13 runnings of the race so far, there have been plenty of great stories in a place known for its humid heat temperatures and biblical thunderstorms! The first event was held in 1999 and the inagural race came at a crucial time for the world championship battle that season. Mika Hakkinen arrived in Kuala Lumpur with a slender two point advantage over Eddie Irvine. What’s more, Michael Schumacher chose this race to return after his six race absence as he recovered from the broken leg he suffered at the British Grand Prix. Schumacher returned in style, by qualifying a whole second faster than anyone else, then dictating the race so well, Irvine was almost too slow to beat him. The Ulsterman got help from the normal Ferrari no.1, twice being allowed into the lead. He used clever defensive tactics to keep an exhausted Hakkinen back in third place. Just as Ferrari celebrated a magnificent 1-2, the team were thrown out after measurements from the scrutineers suggested the team were running illegal barge boards. The fault was even admitted by technical director Ross Brawn and the championship was Hakkinen’s. Conversly, Ferrari’s lodged an appeal, saying the measurement taken was from an angle, not a flat surface. A week later, the FIA overturned the decision made by the stewards and Ferrari kept their victory. The Schumacher family have had plenty of success down the years in Malaysia. Ralf produced one of his most convincing displays in 2002 to lead home a Williams 1-2. That day, his older brother clashed with Juan Pablo Montoya in the first corner and the Colombian was given a very harsh drive-through penalty. At least he made some history in becoming the first ever recipient of one of these penalties! Schumacher Snr won the final race in 2000, more remembered for the red wigs the team showered themselves on the podium with after wrapping up a second constructors title in a row. The race also brought a sad end to Johnny Herbert’s career, as he sustained leg injuries in a nasty accident when his Jaguar rear suspension collapsed. In 2001, the Ferrari team produced a stunning recovery from a synchronised gravel visit from both Schumacher and Rubens Barrichello, then a 84-second pitstop in the midst of a traditional Malaysian monsoon. The team’s decision to fit intermediates saw them ending up annihilathting their rivals once the Safety Car withdrew. Malaysia was also the setting stone for a changing of the guard in 2003. Then, a 21-year old fresher looking Fernando Alonso stunned the paddock by becoming the youngest ever poleman for Renault. He went onto finish third on an aggressive strategy, becoming the first Spaniard on the Grand Prix podium since 1956. The race was controlled by Kimi Raikkonen, with the 23-year old winning his first race for McLaren, a feat that left Ron Dennis close to tears. 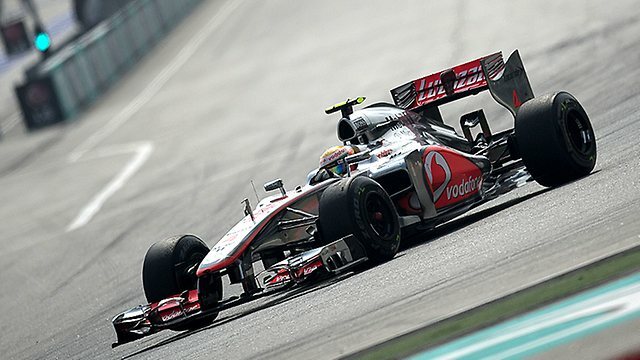 That day gave us a glimpse of the exciting future that lay await for Formula One fans. A year later, Jenson Button joined the elite when he made up for two agonising near misses in Malaysia previously and earnt his first F1 podium for BAR Honda. For the record, the 2004 race was Schumacher’s third and final Malaysian success. There were victories for Alonso in 2005 and 2007 for Renault and McLaren respectively and a Giancarlo Fisichella triumph in 2006, also for Renault. In 2008, Raikkonen produced a convincing display to take the honours on the tenth anniversary of the event. A Ferrari 1-2 was thrown away when Felipe Massa made an elementary error and spun into the gravel trap. Raikkonen has had plenty of drama down the years in Sepang and more came his way in 2009. Predicting a thunderstorm in this part of the world is always hard to do, but Ferrari attempted to do so and put Raikkonen on full wets on a bone dry track! The thunderstorm held off for a long while, but when it rained, you know about it. Fading daylight and the unrelanting rain meant the race was stopped and eventually abandoned, with half points being awarded. Button won his second race in a row for Brawn GP. On the same weekend, Lewis Hamilton was forced to face the media after being disqualified from the race in Melbourne for lying to race stewards. 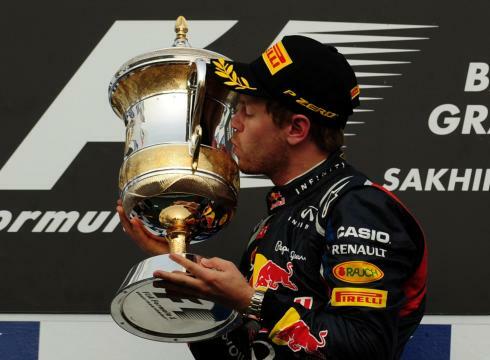 Red Bull and Sebastian Vettel have turned the place into their own over the past two seasons, winning in 2010 and 2011. Can they make it a hat-trick in 2012? Vettel, Alonso and Raikkonen have all tasted success in Sepang in the past – who knows what will happen in 2012, especially with the forecast for a wet weekend. IT IS A British lockout of the front row of the grid for tomorrow’s opening race of the 2012 FIA Formula One World Championship. Lewis Hamilton took his 20th career pole position for Vodafone McLaren Mercedes, just edging out double Albert Park winner Jenson Button in Melbourne. On a day full of shocks, the British team took the first two positions on the grid for the first time since the 2009 European Grand Prix. Having set the fastest time in FP3, Hamilton and McLaren came into the acid test of the one hour qualifying session looking like the driver/team combination to beat. However there were plenty of surprises along the way. Kamui Kobayashi was the fastest driver in Q1 and Red Bull looked very beatable on a Saturday. World champion Sebastian Vettel spun off this morning and was working the steering wheel of his RB8 far more than he ever did with its predecssor. The big casualty of Q1 was Kimi Raikkonen. The returning champion made a mistake on his best lap, then an error with timing saw his Lotus drop out of the running, continuing the Finn’s messy return. As anticipated, both Caterham drivers and the untested Marussia cars failed to make the cut too. Neither HRT of Narain Karthikeyan or Pedro de la Rosa made the 107% rule and for the second year running, the team has been refused permission to start the season in Australia. Again, Hispania are a case of lost time, lack of ability and a total waste of garage space! The plight of Ferrari had been very evident in winter testing, but even the Scuderia can’t have predicted the nightmare they were to have in qualifying. Felipe Massa only just made it out of Q1, but barely featured in the second session and when he did, he looked more like trying to keep the car pointing in the right direction rather than going quickly. As ever, Fernando Alonso looked to be getting more out of his car. His chances of making the top ten ended with a rare mistake from the double world champion, as he copied Massa’s error in Friday free practice by dropping two wheels onto the grass. Same result was produced as even the Spaniard’s class couldn’t save him from being beached in the gravel, although it was at turn one, not turn nine where Massa spun off yesterday. He starts 12th and Massa 16th; Ferrari’s worst combined qualifying since Raikkonen and Giancarlo Fisichella lined up 11th and 19th for the 2009 Abu Dhabi Grand Prix. The car looks slow, unreliable, monstrously ugly and is struggling to stay in a straight line! They aren’t far away from crisis point. Into the final qualifying session and Hamilton set a blistering lap of 1.24.922. No-one initially came close, although Button went only a tenth slower on his second run. Critically, Hamilton abandoned his second run when notified that the pole was his. Strangely, Red Bull didn’t get their act together. An off-colour Vettel begins sixth, behind Mark Webber. The Australian told Planet F1 afterwards; “I don’t know what happened to Seb on his last lap, it looks like he made a mistake. I didn’t have KERS either but I’m satisfied with the job I did.” Michael Schumacher was an excellent fourth for Mercedes GP, three places better than a scrappy Nico Rosberg. This allowed the Frenchman Romain Grosjean to end up a sensational third on his return to the sport for Lotus. Solid efforts from Pastor Maldonado, Nico Hulkenberg and Daniel Ricciardo saw them complete the top ten in eighth, ninth and tenth respectively. The last time Lewis Hamilton started from pole at the Australian Grand Prix was in 2008. He won the race and ended up taking the title too. A good omen perhaps? In the press conference, he said; “I think it is going to be incredibly tough and intense through the race. Obviously looking after the tyres is going to be key. The team need to be prepared tomorrow, as do me and Jenson and I’ll make sure we are.” Well, McLaren not only have the prettiest car in 2012, but for now at least – look to have the fastest too. Tomorrow’s race looks set to be a real cracker. HAVING been seen as a laughing stock in its early days, people forget how far Red Bull Racing really has come. The dark days of Jaguar seem a long time ago now. Double champions for the past two seasons, the Milton Keynes based squad are aiming for a hat-trick of drivers and constructors titles. Once again, they look the team to beat despite some uncharacteristic chinks in the armour in winter testing. Last season had echoes of dominating seasons put on by McLaren in 1988 and Ferrari in 2002. 12 wins from 19 starts, starting from pole position in all but one race. With a car that was the class of the field and incredible pitwork from the team, Red Bull Racing showed everyone the way in 2011. This year, the team has all the main key personnel in place for another tremendous season. Adrian Newey’s new car, the RB8 has hidden its one lap potential so far, but looks incredibly consistent over a race simulation distance. However, reliability issues which wrecked the final day of pre-season testing in Barcelona means they head to Melbourne having not severely tested the new car with the additional front wing and rear exhaust they brought to the closing stages of the Spain test. You will be hard pressed to find big odds on someone other than Sebastian Vettel as championship favourite. The German looked right in the zone last season and has the opportunity to join a real elite group. Only Juan Manuel Fangio and Michael Schumacher have achieved three successive world championships. 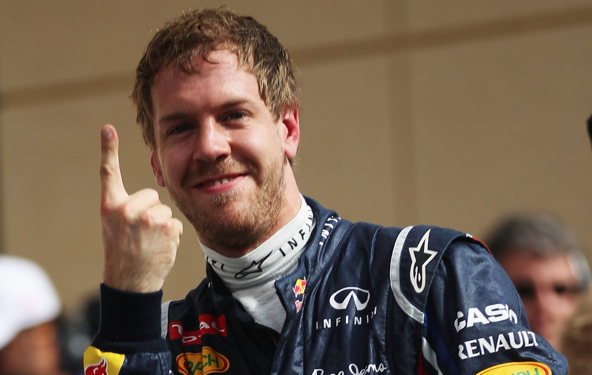 Vettel has a great chance to match the feat in 2012 and has the all-round package. As long as the car is reliable enough, it is difficult to see anyone past him again as champion. However, I would be very surprised if he dominantes as much as he did in 2011. By his standards, Mark Webber’s year was woeful. He was horribly outpaced by Vettel all season, only beating his team-mate all weekend once. The irony of that was Vettel’s home race at the Nurburgring. However, his daring overtake on Fernando Alonso through Eau Rouge at Spa last season and finishing the year with victory in Brazil will have given the Aussie some much needed confidence going into the winter break. If Webber can get a grip of qualifying and the Pirelli tyres again, he has what it takes to give the rest a fright, as we saw throughout 2010. If not, he will be under pressure, especially with two hungry, young Toro Rosso drivers after his seat for the future. Once again, Red Bull Racing look like the team to beat. Who has the capabilities to beat them over a season? If someone does, it will be a mighty effort.